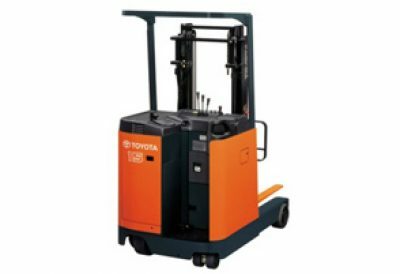 Toyota Electric Reach Trucks feature rugged construction, advanced technology and an ergonomic design for optimum performance and value. The 7FBR has Stable Suspension Control, a similar system to the SAS (System of Active Stability ) used on the 7FG/FD and 7FB Series. It offers higher levels of stability when the reach truck is turning or when handling loads extended on its reach legs. The compact and powerful AC drive motor provides smooth starts without jerky accelerator operation. Since the AC motor has no bushes or contactors, it has minimal maintenance, saving you time and money. The Power Keep Function allows the 7FBR to maintain its “just charged” performance longer.